Ernie Smith seems very much at home up a ladder pruning his trees. He was not quite so comfortable down a hole fighting with a possum. This story was sent in by Ernie Smith’s wife Christine. The couple live in Helensville. 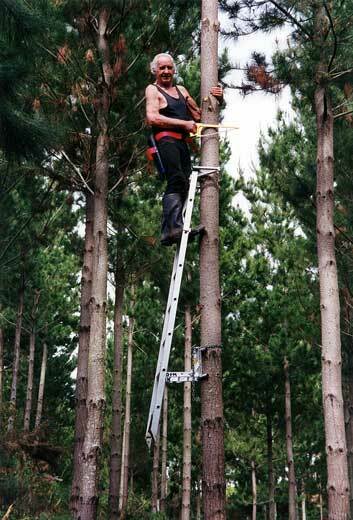 Our gang were harvesting trees at South Head Woodhill Forest (near Helensville) in the 1970s. We noticed that possums always came in at night and ate any scraps left from our lunch. Don, one of our team, dreamed up a scheme to dig a 2-metre pit at the lunch place to catch some of the pests. It was black sand country, so no sooner said than done: stems of cutty grass across the top, single sheets of the Herald newspaper, a thin layer of sand, a juicy apple for bait and the trap was set. Next morning when we arrived at work the bait was gone, the paper had collapsed and we had a fat possum in the bottom of the hole. Try as it would, the possum could not climb vertical sand walls. When you climb a tree to catch a possum, you grasp the tail firmly and the possum pulls hard to get away. Being stronger, you bodily drag the possum off the tree, swing it hard outwards and drop it to the waiting dog. Fool proof. This does not work when down a hole with an active possum who regards you as ladder to heaven, and the perfect opportunity to get back to the surface. So instead of me hunting the possum, it was the possum climbing up me to reach daylight. Possums have sharp cat-like claws, so I objected to being climbed. I fought hard to brush it off. Round and round the hole we went. My calls for help went unheeded because the sight of the 12-stone boss being chased around a hole by an irate possum sent the bushmen into gales of mirth. It seemed to last forever. I knew no-one could get in to help – not that anyone was offering. In desperation I held up one hand: ‘Pull me out – pull me out!’ Don grabbed me and pulled with all his strength. This left me with only one hand to fend off the possum and, if you’ve ever tried it, one hand is not enough. It ran up me and escaped into the forest without a scratch – which is more than I could say for myself, or even Don who was also scratched. I suppose the moral of this story is ‘Look before you leap’. It may be more appropriate to say, ‘Choose your companions carefully when you decide to hole up!’ Yes, we did fill in the hole. And no, we don’t use that method to catch possums any more.